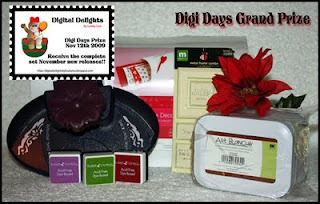 Julie's Crafty Space: Digital Delights is having a party! Digital Delights is hosting our first ever Digi Day on SNR Card Universe!!! Join us Thursday November 12th from 7PM- 8PM (CST) 1AM UK in the Digital Delights Group at SNR. Bring your favorite holiday sweet treat recipes to share during the event. Some members of the DT will be there, and everyone will have lots of fun. Everyone that comes to the party will receive a FREE image from Digital Delights. I can't tell you what the image is, because that's a secret...but it's fabbylicious. We also have a challenge for you. Go and get the adorable cookie image I've used on my card FREE here, use it to make anything you like, then upload it to the SNR Gallery and TAG IT cookiedelights09. Make sure your entry is in before midnight (CST) on Friday 13th November and you will be entered into a draw for a fantastic prize comprising of all the new November releases, plus everything in the pic above. For my card, I've coloured the adorable cookie image with pro-markers, then 3D'd the bows, and added pink gems in the middle. For the icing I've coated it with glossy accents. I've added raffia along the centre, and a pink bow with pins. Dp is Scrapworks, Skinny collection. A sentiment will be added at a later date. 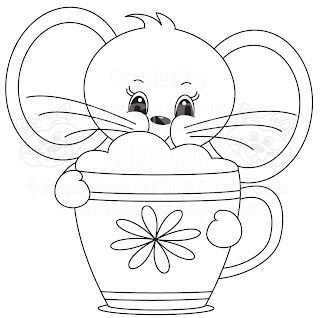 Don't forget to grab the Friday Freebie, Cappuccino Pippin, without the watermark from SNR or PCP. Gorgeous card Julie, still can't join up though, it's so frustrating.